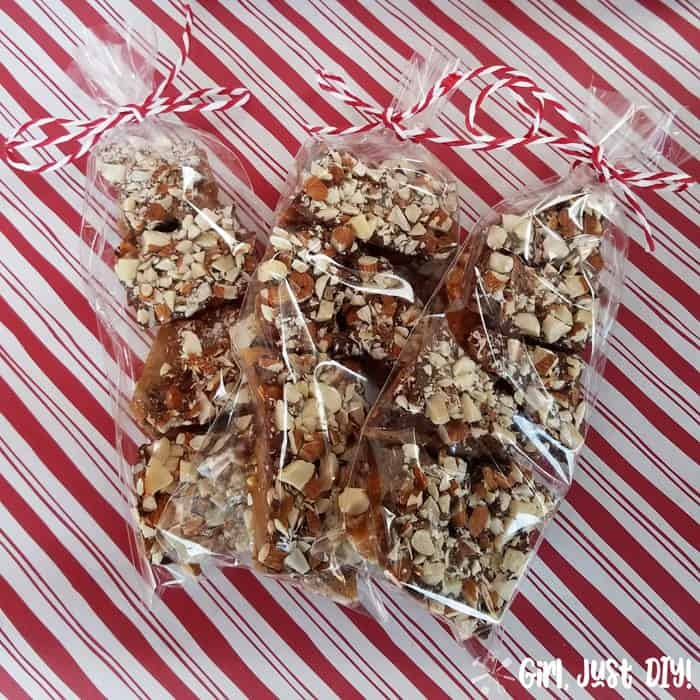 Homemade English Toffee - a Sweet DIY Gift - Girl, Just DIY! Friends, today is a sweet, sweet day. Not just because it’s been a good day around here; it’s also sweet because I’m sharing one of my favorite sweet treats at Christmas time. You can make it any time of course, but I only make it at Christmas because it’s my kryptonite and I eat way too much when it’s around. 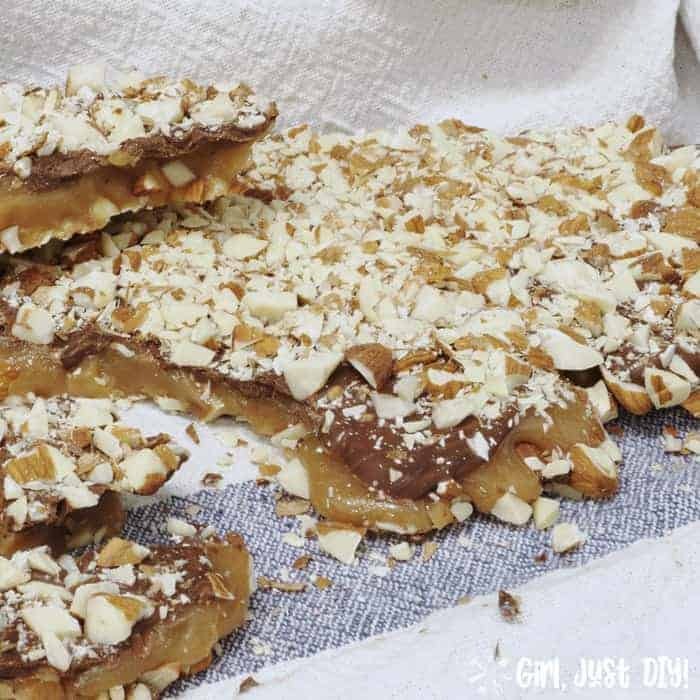 I’m talking about Homemade English Toffee and this recipe is so easy that you’ll want to make some right away. 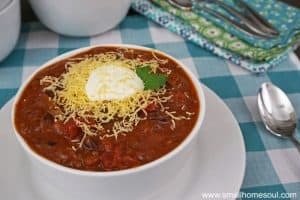 The recipe makes one batch but I always double it up because we give it to friends and neighbors and it saves time making a double. 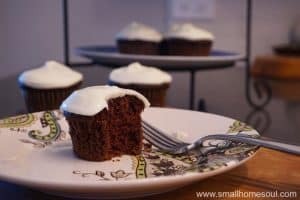 You need only one cookie sheet for this recipe but you’ll see two in my pictures. And I just learned something that surprised me. Apparently what I’ve been calling English Toffee all these years isn’t quite correct. Apparently English Toffee is just the plain candy part. When you add Chocolate and Nuts to it, it becomes Butter Crunch. Did you know that? Apparently it’s a common mistake and since it’s so common I’m sticking with the name I’ve always called it. 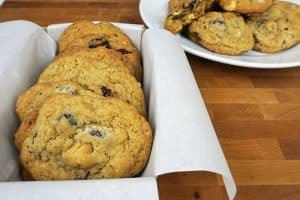 One of my other favorite sweet treats to give to our neighbors is the super yummy Chocolate Chip Macadamia Craisin Cookies. A better cookie does not exist, IMHO. I usually give the cookies and the toffee together. 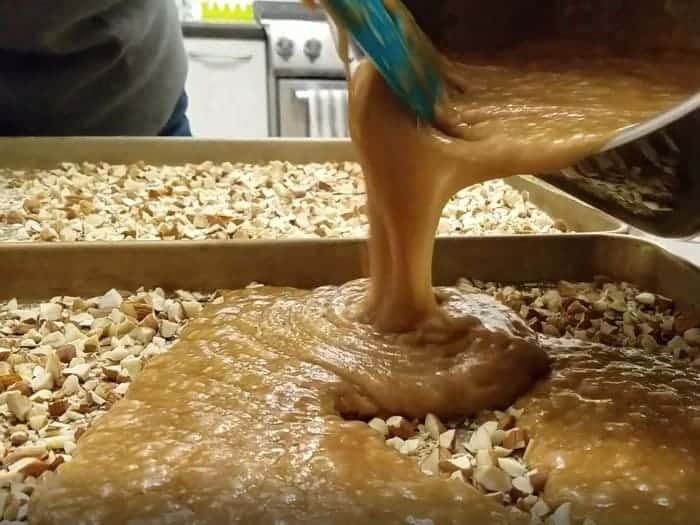 Before you get started making your own Homemade English Toffee, let’s step through the process. I suggest reading through all the steps so you’re comfortable with the process before you ever begin. NEVER make candy with little kids around, and especially if they like to be underfoot. Wear a thick apron as occasional splatters can happen. Have your cookie sheet near the stove so you don’t carry the bubbling liquid too far. Use an extra long spoon or wear an oven mitt while stirring to keep the heat off your hand. 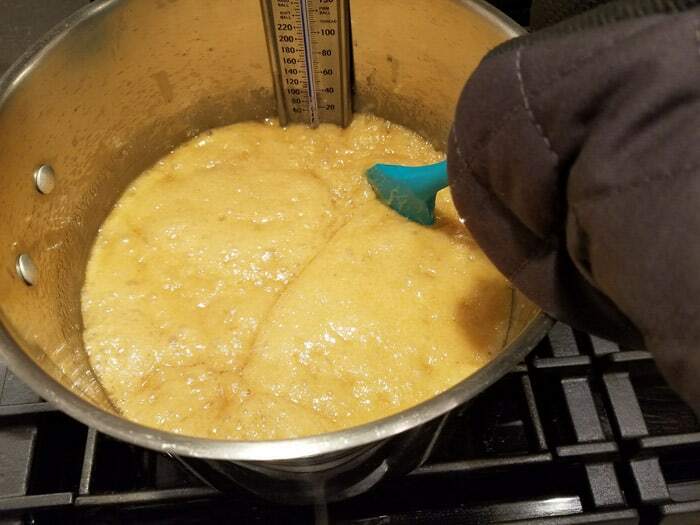 Use the suggested size size pot; toffee expands while cooking and you don’t want overflows. 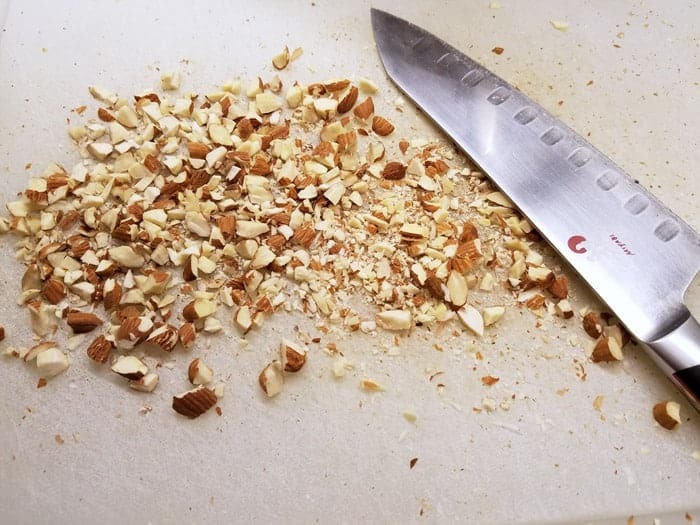 Chop nuts spread half on parchment. Retain half for later. 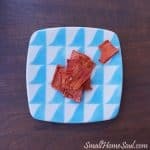 Set the cookie sheet on a cooling rack or thick cutting board to protect yourcounter top. 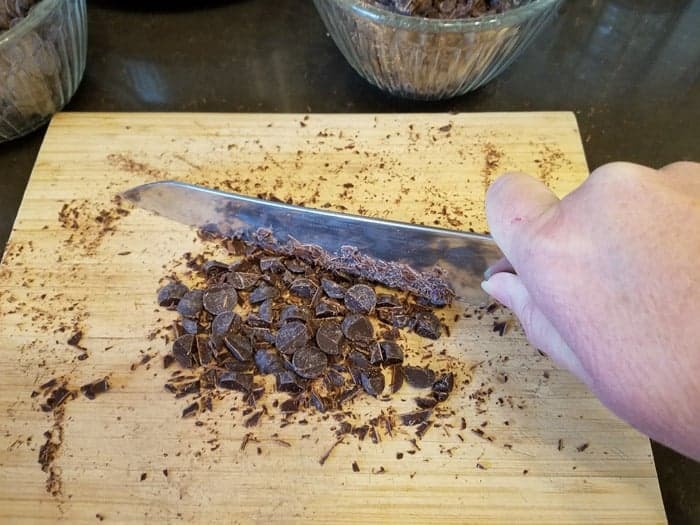 If using big chips, or darker chocolate in a bar, shave and chop it down at least to standard chocolate chip size. Otherwise it will sink into the hot toffee mixture. Divide the nuts and chocolate into separate bowls if you make a double batch. That will save measuring later. 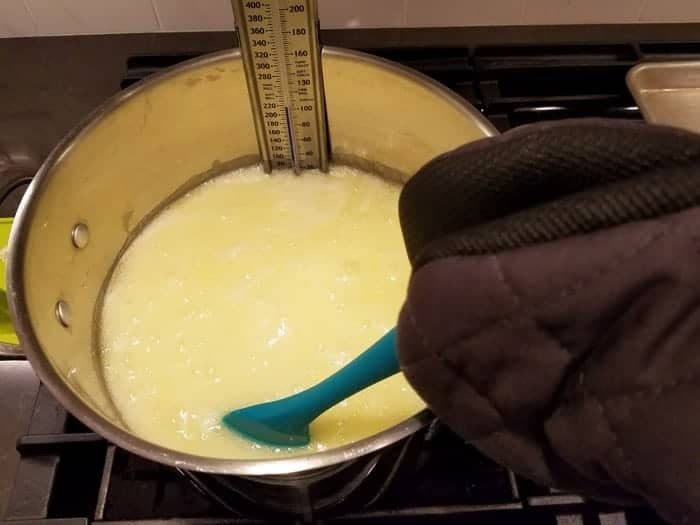 Melt the butter in a heavy-bottomed pot over medium-low heat. Add the Sugar, Water and Salt. 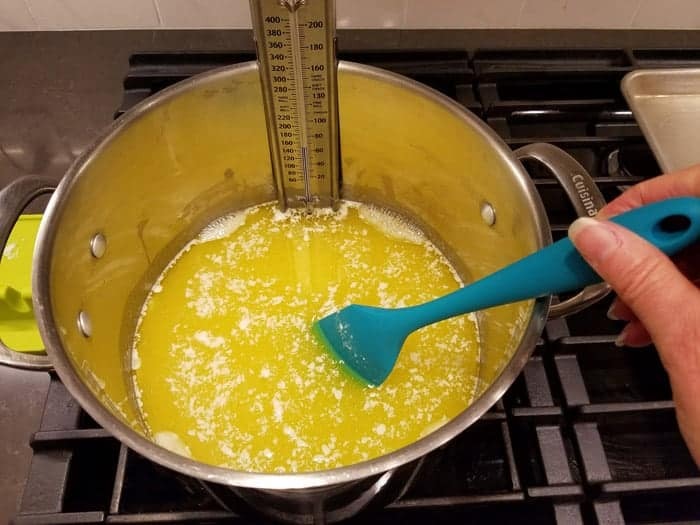 Insert the Candy Thermometer and ensure the tip doesn’t rest on the bottom of the pan. I love the one I have because I don’t want to have to worry about that. 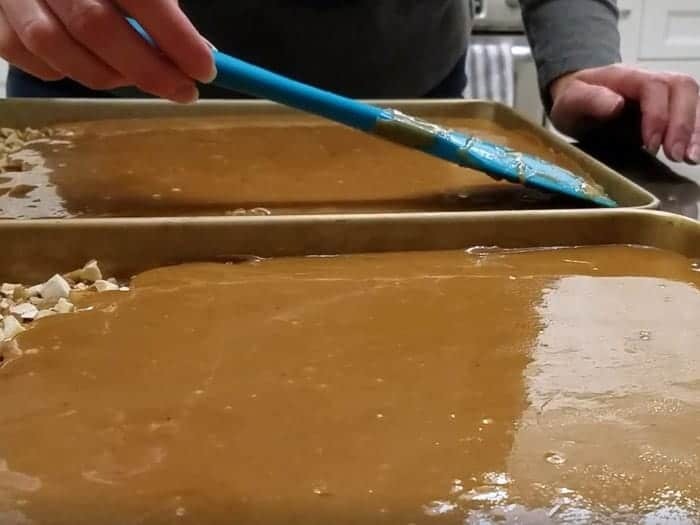 You’re going to cook the toffee to the Hard Crack stage or 300° Fahrenheit. Increase the heat to Medium until the mixture begins to boil. Stir constantly with the silicon spoon. You can use a wooden spoon but I like the silicon best. Slowly increase the temp to medium-high. Keep cooking and stirring and keep an eye on the thermometer. The last 5 degrees goes super fast! I mean SUPER fast and you don’t want to burn it. 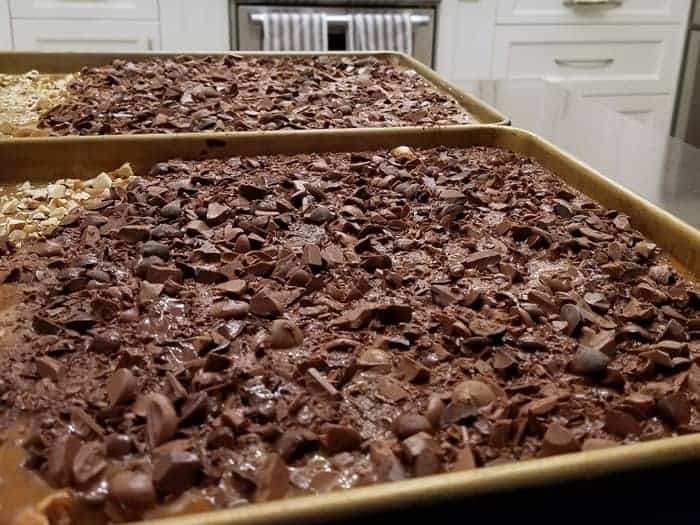 When the temperature gets to 300° immediately turn off the burner and using the pot holders pour the boiling toffee evenly over the nuts on the cookie sheet. Scrape the sides of the pan but don’t scrape the bottom as this tends to get a little burned as you pour out the toffee. Spread the mixture out to cover the nuts. Wait a few minutes then sprinkle the chocolate over the hot toffee. Wait another few minutes for the chocolate to melt and then spread evenly. Top with remaining nuts and gently press nuts into melted chocolate using a piece of parchment and your hands or a clean silicone spoon. Let cool overnight until chocolate hardens. Lift one end with a knife or spatula and start breaking into desired pieces. You can package it any way you like; in cookie boxes, goodie bags, small tins. And yes, even mason jars with a little homemade tassel tied to the top. 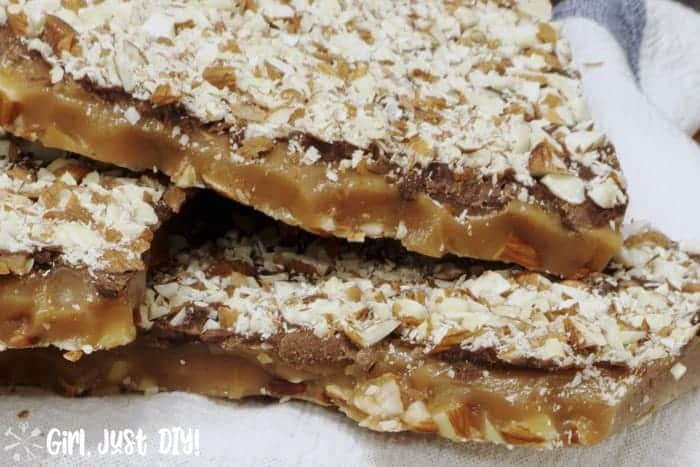 🙂 Any way you wrap it up everyone will love to receive some of this easy-to-make Homemade English Toffee. 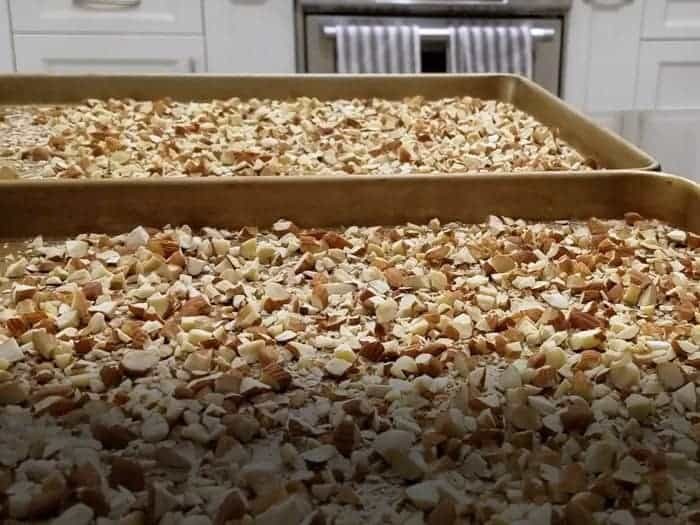 Spread half the nuts on a parchment lined 10″ x 15″ Cookie Sheet and place on a cooling rack. Melt butter over medium low heat. Add Sugar, Salt, and Water and slowly increase heat to medium and bring to boil stirring constantly. 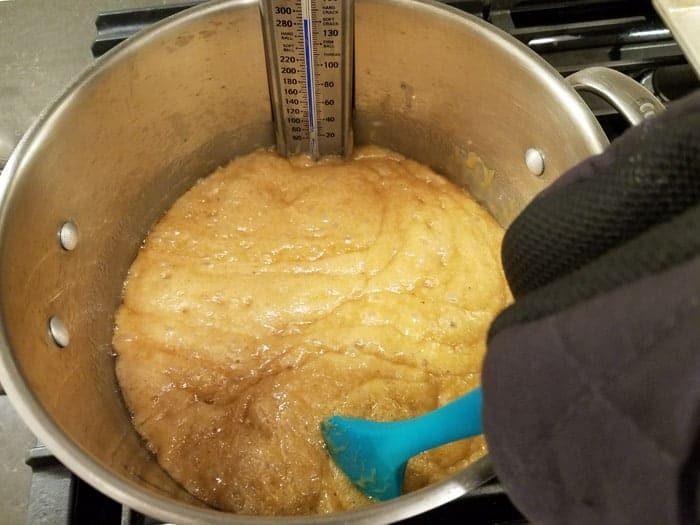 Increase heat slowly to medium-high and cook until 300° is reached on candy thermometer still stirring constantly (about 20 minutes in all). 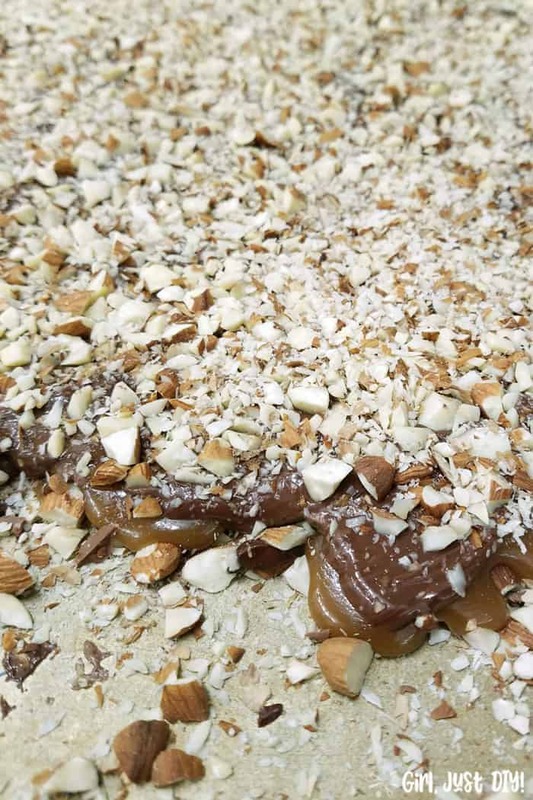 Quickly remove from heat and pour toffee evenly over nuts, spread with spoon if necessary to cover nuts. Sprinkle chocolate bits over hot toffee and let sit a few minutes to melt. 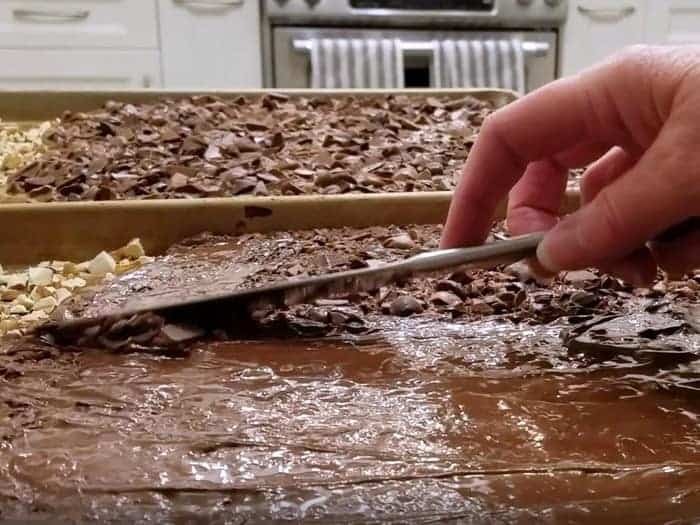 Spread melted chocolate with a butter knife or spatula then top with remaining nuts. 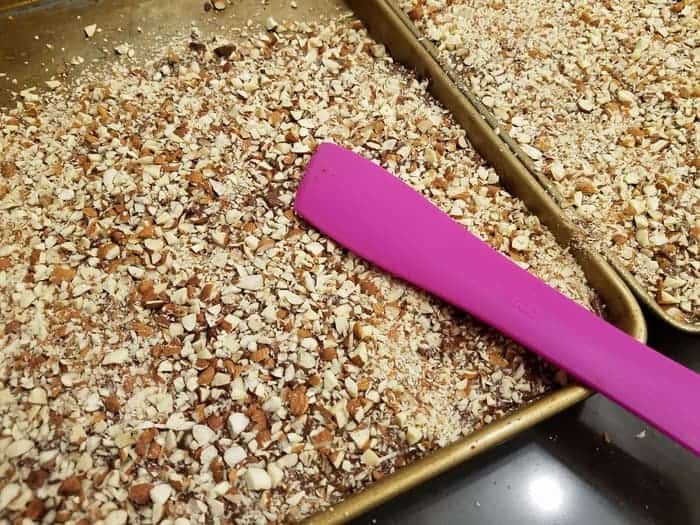 Press nuts in with back of clean spoon or spatula. Let cool overnight until chocolate is hardened. 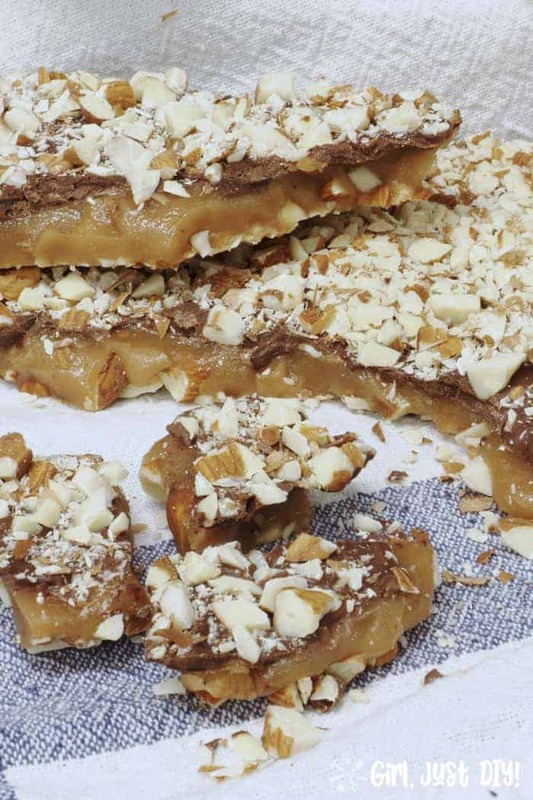 Break apart and enjoy the goodness of this sweet Homemade English Toffee. My favorite part about breaking up the toffee into pieces is the little crumbs left on the cookie sheet when I’m done. They’re good to scoop up and pop into your mouth, of course. But that’s not my favorite. I pour them into a pint mason jar and pop it into the freezer. Then I use them through the year as a topping on vanilla ice cream. Oh my gosh, it’s the best!! You will love it, I have few pieces left of what I saved for us and I’m shocked it’s still here. I’m sure it will be a big hit at Easter too. I love it so much, I wish it was calorie free 🙂 xoxo friend! English Toffee is, by far, my fave! Thanks for the recipe, and great ‘caution hints’, Toni! Pinned!